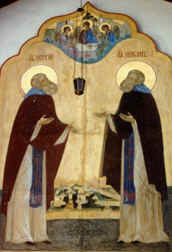 St. Sergius of Radonezh is the patron saint of Russia, father of northern Russian monasticism, and founder of the Holy Trinity Lavra Monastery (see Sergiev Posad). 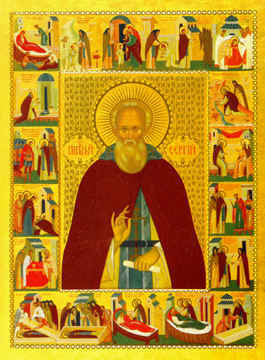 Few people have had such a profound influence on Russian life as St. Sergius and his monastery. He was a great mystic and ascetic, whose life spanned much of the 14th century, at the time that Russia was occupied by the Mongol Tartars. Even as a child the future saint was devoted to the Holy Trinity and sought the monastic life. After the repose of his parents, in 1334 the 20-year-old youth went into the deep forest, about 45 miles northeast of Moscow, to seek spiritual solitude as in a desert. He lived a very austere ascetic life, marked by extreme poverty, hard physical labor, and profound humility and simplicity. After a few years of solitude in the forest, disciples started to gather around him, and Russia was forever changed. Through the labors of St. Sergius’ disciples, the northern forest wilderness blossomed with numerous monasteries, which were to play a very significant role in the subsequent life of Russia (and America). In St. Sergius’ great humility, he rejected all honors: only reluctantly did he accept ordination as priest and appointment as abbot of his own monastery; and he flatly refused to accept the office of Metropolitan of Moscow. The many spiritual gifts granted to him include powerful and effective prayer, clairvoyance, spiritual direction, and numerous visions. He reposed in 1392. 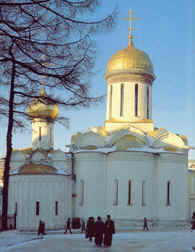 St. Sergius’ church, monastery and life’s work were dedicated to the Holy Trinity (icon to the right). 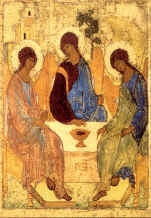 The Holy Trinity expresses the unity between the three Persons of the One God, and hence, also symbolizes the spiritual vision of the restoration of all things to their original unity, including Russia. St. Sergius recognized that the Russian Church and the Russian people were united, and that unification of Russia lands was required for their mutual well-being. Thus, with St. Sergius’ spiritual guidance and blessing, the Grand Prince of Moscow, St. Dimitri Donskoi, united the fragmented Russian principalities under Moscow’s leadership, and in 1380, defeated the Mongol Tartars. As a result, Moscow became the center of Russian life, and St. Sergius and his Holy Trinity Monastery have been looked to for guidance and support ever since. St. Sergius’ original wooden Holy Trinity Church burnt down and was replaced in 1422 by a white stone church (photo to the left), for which St. Andrei Rublev (see our Saints' Lives article) did much of the iconographic work, including his most famous Holy Trinity icon (see previous icon). This icon is an eloquent expression and testimony to St. Sergius’ spiritual vision of the beauty of salvation. In the process of building the stone church, St. Sergius’ relics were uncovered, and it was discovered that after 30 years, his relics remained incorrupt. 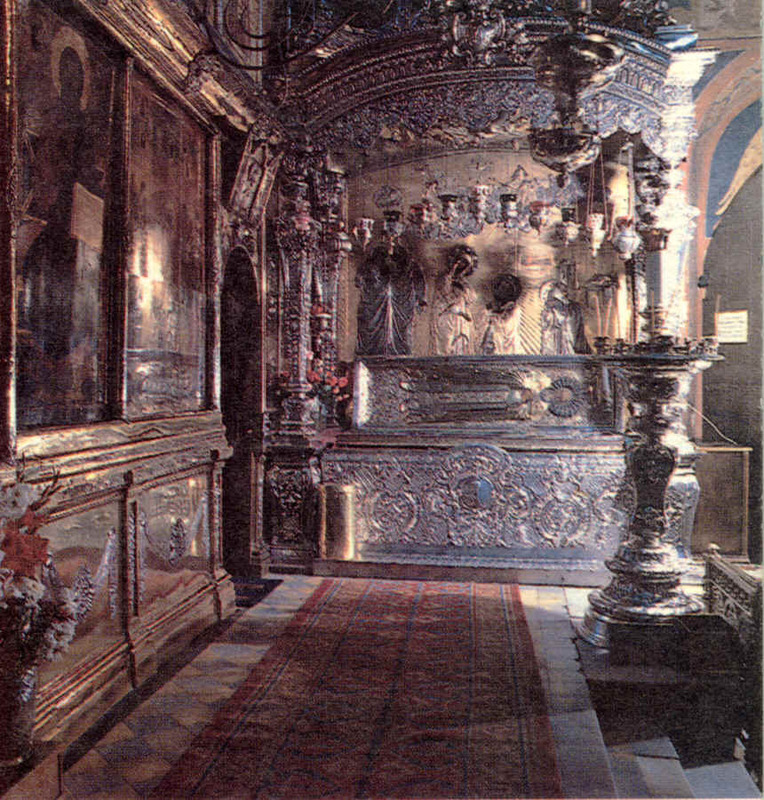 His relics were placed in a reliquary in his Holy Trinity Church on the right side of the solea, readily accessible for veneration (photo to the right). Ever since the discovery of his incorrupt relics, untold numbers of healings and other miracles have occurred. Every day, all day long, pilgrims come and venerate St. Sergius’ relics, and are profoundly touched by being in St. Sergius’ presence. The second icon from the top was written/painted by the Master Iconographer, Fr. Theodore Jurewicz of Erie, Pennsylvania, and is part of the deisis in the sanctuary of St. Innocent Orthodox Church in Redford, MI.